We are almost fully recovered from the asthma attack last week.I think she has one more day of antiobiotic and a little bit of steroids to take. 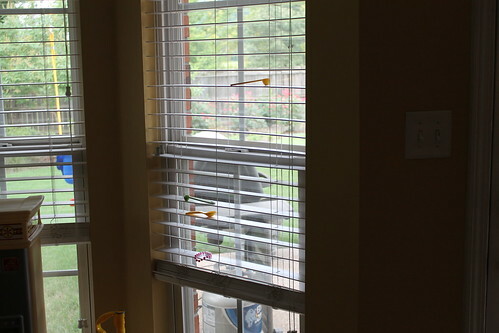 As mentioned previously I looked over to find that she had put measuring spoons and a bracelet on the blinds. Here is the picture. She finally told me how she got the tallest one up there…she moved a chair. Ok. So blogger changed some stuff and I have yet to find out how to space between pictures. Yay. 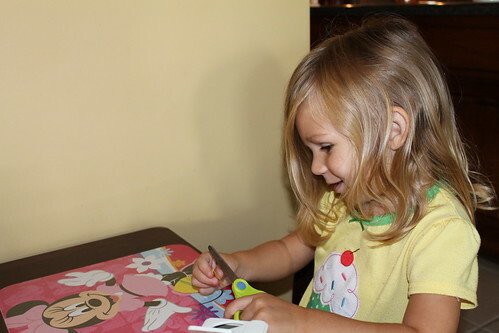 Anyways…EK has been using scissors at school recently and I bought some for her a long time ago…and thought it would be a good idea to give her some scissors while she was heavily medicated (the shakes). Amazingly she calmed down to cut. Now she walks around saying…can I cut? Can I cut? To say that EK likes boxes and bags would be an understatement…she freakin loves them…look at the amount of boxes and bags around her kitchen. She can keep herself entertained for hours with bags and boxes. She loves to put stuff in them and carry them around. Things will slowly disappear around our house and we have to search through her kitchen. Michael lost his phone one day and she had put it in her fridge. It was on vibrate and someone called it and it scared the MESS out of EK. 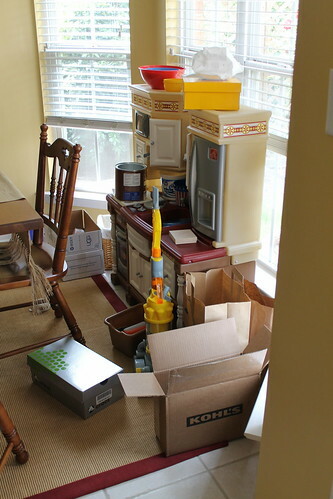 It was hilarious…I lost my phone case and decided it was time to sort through her kitchen….take a look at the last picture. She has been in trouble for this before. 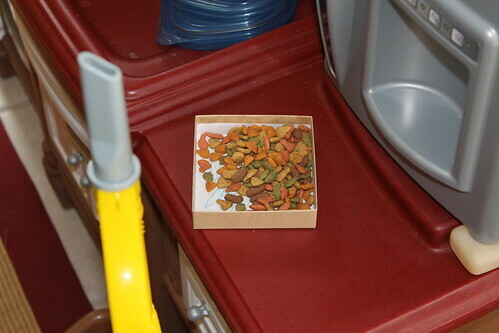 She is not suppose to touch the cat food…and I discovered that she put some in a box!